I have to say that ever since I saw this paint scheme, I wanted one. This is my Davide Giugliano rep Chaser V helmet and in typical style, I picked this up in an end of the season sale. I was really impressed with my previous Chaser, and that was despite a slightly tighter fit. The Chaser V is no different, but despite this, once on, its actually very comfy indeed. The V benefits from a wider visor opening and a slightly different shell shape and isn't very noisy. I do wear ear plugs all the time so this may negate some of that. The build quality is excellent, the matt finish is deep and the helmet superb, but there is a downside. The helmet came with two visors, the standard clear one and the silly Pro-shade one, which I immediately didn't like, so I had to get a official replacement dark visor. 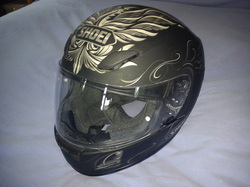 As I wanted a silver Iridium visor with a pinlock, it cost me over £90, which is a third of the cost of the lid. Yes that's not the helmets fault, but it was still annoying. This is my trackday helmet and I've never seen this design on anybody else. I'm not sure if the pattern is trademarked as I may try and get this design painted on other helmets. Its a good tight fit, but never hurts when riding. The vents are excellent, but as a result make the helmet noisy, so earplugs are a must. This is secured with a double D ring strap and has a pinlock fitted, which is excellent and I've never had any problems with it. I regret to say, that this helmet was killed in my crash at Brands Hatch on July 13th 2013. It did its job, keeping me concious all the time and saving me from any serious injury. If you look directly below this review, you will see my review of my previous HJC. At the time of writing I wasnt too keen and further into the helmets life, those niggles persisted. Rain getting into the visor ruined the pinlock for example, leaving little scratches where grit followed the water in. 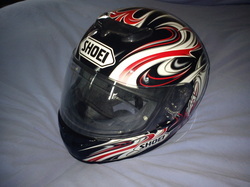 I kept it as it was really comfy and as the shell was still sound, I was looking for a new clear visor. When visiting Lids Direct, I spotted that these Ben Spies reps were still on offer (I nearly bought one a week before I picked up my Chaser V). My friend Dom had just got one and when I checked, they had them up at £165 I think, but I also had a 20% discount code, making it £135, so I couldn't say no. Delivery was quick and first impressions are good. The fit is excellent and there are a few improvements on the previous model. The visor now uses the Max vision pinlock and this is secured much better in the helmet. You still get the two visors (that's £80 right there) and the front vent is more substantial. I already really love this lid. 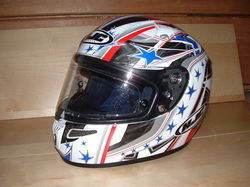 This was my very first helmet and yes I went for it because of the design. I loved the two evil clowns on the side. I drove down to Kent to the headquarters of Helmet City, where I got all the help I needed trying it on and making sure the fit was right. 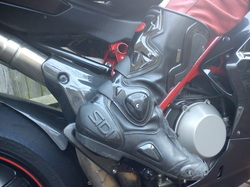 I think it was around the £250 mark and wasn't very noisy as there were only two vents on the front of the helmet. Again Double D Ring strap and pinlock fitted which meant that with this helmet I never had a problem with it fogging up. Sadly I crashed my hornet in this and the lid took a knock to the chin bar, so in order to be better to be safe than sorry, I ordered the XR 1000 as my replacement. Very, very comfy, but quite noisy due to the increased number of vents on the helmet, so earplugs were a must. Like all my helmets this was secured with a Double D Ring and also had a pinlock insert fitted, but still misted up on the left side of the visor when it rained, or was really cold. Again, another purchase on http://www.helmetcity.co.uk/, but this time I got it delivered to me as I was already confident that the helmet was going to fit. 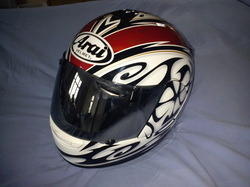 I was wearing this the day of my serious accident that killed by Z1000, thankfully this did an excellent job and protected my head when it needed it most. These premier race boots represent nearly 50 years of development by the Italian firm and it shows. Constructed from Lorica, a leather alternative, with replaceable parts, including ceramic toe sliders, they provide all kinds of protection for my feet. 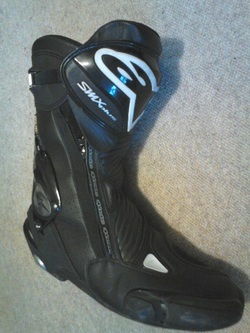 Super comfy on the bike and thanks to the excessive locking mechanism they will stay put in a spill. The adjustable vents work well to keep feet cool, but the perforated upper lets in rain water. With prices north of £250 they’re not cheap, but are confidence inspiring. For the UK the non air version would have been a smarter choice. These were the first boots I bought and now over five years later, they are still waterproof. The tread on the sole has gone, but now I only wear them in the rain when using my El Nino suit. After wearing the Vortice and the Supertechs, you realise that the fit is a little looser, especially around the calf, but there is still a nice amount of armour on the boot, which makes me feel a little safer when using them. I love these boots. They're all day comfy, warm and totally waterproof. The holy trinity for boots. 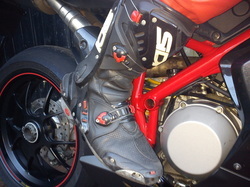 I needed a replacement for the Sidi B2s (see right) and as I was really happy with my Supertech Rs I decided to check out the latest generation of the S-MX Plus boots by Alpinestars. Unlike the Supertechs the boot is a one piece construction and most of the armour is on the outside. The inside of the boot, is secured to the foot with a slightly offset drawstring which helps seal the waterproof inner lining and an external zip and a simple ratchet finalise the process. The soul has been designed to look like a tyre tread which in turns offers excellent grip on wet pegs. There is one serious downside to these boots. They squeak so much its almost funny. I know that they annoy some people because they are that loud, but do I care? Not at all. They're for riding, not walking. These are a total waterproof glove, with great levels of feel, a great look and a decent amount of armour. A lot as been written about these gloves and the main sticking point with them is that they are only really suitable for use in three seasons. 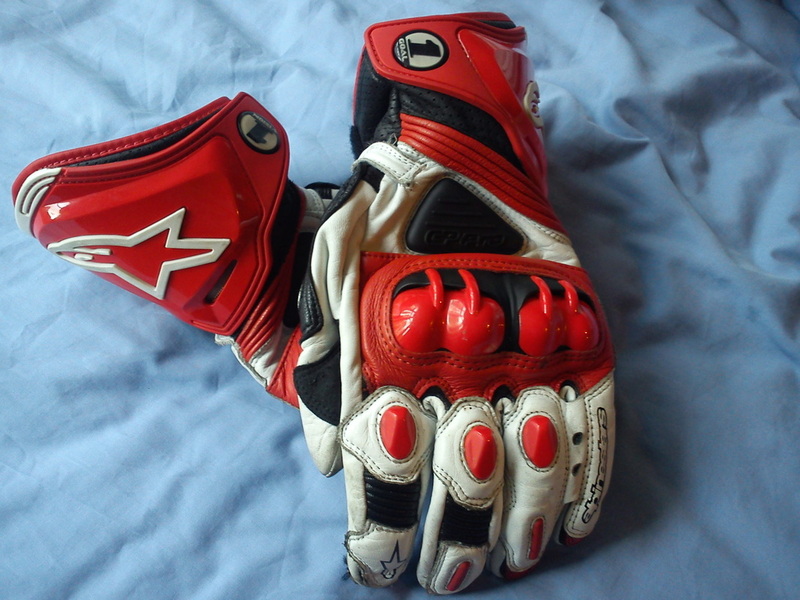 To be honest, I have never found a pair of Alpinestars gloves that are really good in winter, but as these gloves make using the controls very easy I've decided to counter the faults with some heated grips which take the bite out of the cold and make it possible to use these gloves all year round. The only gloves in the Alpinestars range that cost more and are supposed to be better are the GP Techs, but the GP Pro glove is all the summer/race glove you will ever need. These gloves are noticeable plusher inside that my Arlen Ness gloves, but come with an slightly more armour, including Kevlar reinforced panels on the fingers. The palm is made of kangaroo leather, which is supposed to be lighter, stronger and more subtle than tradition bovine leather, therefore aiding in comfort and feel. Like most top spec Alpinestar gloves, there is a webbed bridge between the last two fingers on each hand, designed to ensure that the little finger gains more support in a crash. The ventilation is also first rate with hands only getting a little sweaty on really, really hot days. All in all, an excellent glove, but there are two things I'd like to make note of. 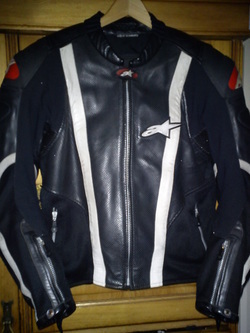 I found that when using my Alpinstars SM-X jacket, the cuff was a little on the short side and that they also took several weeks, including trackdays, to really break in, leaving a few callluses on the inside of my hands. 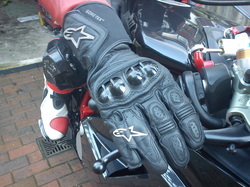 I got these when I bought my Arlen Ness one peice suit and as I got a bit of a discount, these £100+ gloves were effectively free. Although not the prettiest of gloves, that mass of red plastic on the back on the hand looks like it could have been made during design class in secondary school, they are very functional. There's lots of feel for the controls and the level of protection is appears very high, especially the armour around the wrist. Thankfully I've yet to crash in them but they do feel very secure and the excellent level of ventilation means that they stay all day cool when it gets really hot. There is a downside to that, they are totally unsuitable when its even slightly chilly. I think we all know by now, that I'm a fan of Italian motorcycle kit, both bikes and clothing. I've found their quality and style something to rely on. So with that attitude, it's unsurprising that I've replaced my crash scarred GP Pros with the 2015 version. These come with the same usual quality leather and similar armour; bit less on the tips of the fingers, but the same around the wrist. At £150 they are by no means the cheapest gloves, but nor are they the most expensive; Alpinestars now do £330 Supertech gloves designed for racers and the rich. Cool when riding, so I only really wear these when the temperature reach double figures, but still a superb glove and broke in quicker than my previous pair. These are the best winter gloves in the world. Fact!. It really is as simple as that. The Rukka gloves are Gore Tex lined, have a dual chamber construction, so you can have more feel on the palm if necessary and have a lovely thick layer of thermal lining to keep hands warmer. These are close to £200 but in my opinion they are worth it. 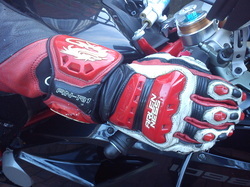 Are they as good as heated gloves, or heated grips, no not really, but then nothing is (except a car). My hands still got chilly when temperatures were down below 4 degrees and no matter what anybody says, when its cold, you feel it, no matter what you wear. If anybody says 'yeah, I never feel the chill through x,y,z' then they are telling porky pies my friends. What I really like about these is their level of protection, which is nicely all over the glove and that gives me confidence that my hands will be okay if I come off and that's what really matters. I will freely admit, that I love this suit, but like some many things in this hobby of mine, it ain't cheap. Not cheap, but still worth every penny. With a RRP of £1000, you can easily find suppliers shaving several hundred quid off the price and that makes this suit a worthy investment. After crashing heavily in the Arlen Ness suit below, which resulted in a nasty friction burn to my arm and a destroyed suit, I was after a off the shelf one-piece suit which had hard external armour, as well as the standard internal shoulder and elbows etc. My reasoning is that where the leather grips on contact with tarmac, the plastic will slide, reducing the chance of injury. The fact it looks great too, is by the by. Alpinestars list many features like a calf zip, an inner waterproof pocket (not too sure about that one if I'm honest), space for both chest and back protectors, interior leg and wrist cuffs to keep the suit secure, a speed hump and a removable mesh lining, but what I really like is the cut and the feel of the suit. 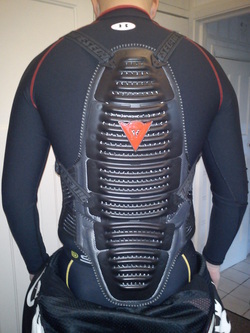 Not the most comfortable thing off the bike, but what suit is, when riding, the cut seems to hold my body in the right place, reducing the need to physically hold it there, greatly reducing any fatigue when riding. Compatible with both my Alpinestars gloves and boots, which are both designed to fit over the suit, this is genuinely one of the most comfortable pieces of riding kit I own. As its vented, it gets limited use in the winter, but when the temperatures get warm enough, this is always the first thing I reach for when heading out for a ride. This suit is the first one peice suit that I have owned and wear it pretty much exclusively for the longer days in the saddle or for trackdays. When on the bike the suit is very comfy, but when standing up, I have to unzip it a little to give my shoulders and chest a little more room. This also reduces the level of tightness around the groin, which is clearly a plus. The level of armour is good with internal armour in the shins, shoulders and forearms. I was wearing this when I had my fast off at Snetterton at the end of the Revet straight and the suit didn't wear through and kept me safe and sound within. This jacket comes with fairly big speedhump, which although I'm sure it helps with the aerodynamics, in not so sure it's of any real use 90% of the time. Looks cool thou. The leather has some good venting and only really feels uncomfortable when stuck in traffic on a hot day. For £650 I'm very pleased with the suit, but if i could afford it, I'd happily replace it for a better model. I've had these since I started riding, buying them just after I passed my test. Initially the knee armour caused me a few issues with pinching, but once broken in they have been all day comfy. I had to buy the next size up and the thighs were a little tight, but it means that the waist is a little loose. I wear them with the SMX jacket which zips up around the waist, but not far enough to comply with some track day organisers as I found out earlier this year, which sadly means that the Wiz sliders are pretty pointless. 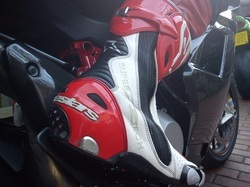 The level of armour is restricted to hard shin protection, with thicker levers of leather around the hip. I have crashed twice in these pants and both times I avoided any breaks or abrasion injuries so they did what I bought them for. With a prolayer underneath they are all day comfy in all weathers and easy to take off. At around £250 they were pretty pricy, but I like the subtle design, with the embossed logo, and the quality of the leather remains very good which is especially impressive and I use these daily riding in and out of Central London. When I bought this, at the start of the winter in 2015, it was the cheapest jacket Rukka made. However, calling is cheap would be misleading. With a ticket price of nearly £500 this was still quite an investment. However, sometimes you just have to bite the bullet and instead of hoping the kit will be okay, you need to invest in some top quality kit in order to know it will be okay. Now discontinued, the jacket is very warm, especially when the removable thermal liner is installed, comes complete with a Gore-Tex lining, adjustable cuffs, double zip, waterproof internal pockets, full shoulder and elbow armour, reflective panels on the arms and back and is made using Cordura a tougher, abrasion resistant fibre. Its a quality piece of kit, so much so, that I've regularly used it as a casual jacket when not riding (I even left the removable armour in). The only issue and I do mean only issue, is there is no venting at all, so this really is a winter, early Spring, late autumn jacket rather than a four seasons one. Like the Matti Jacket, I got these at the start of winter 2015 for the express purpose of using them through the cold weather. At £350, although expensive compared to other offerings on the market, these were also Rukka entry level trouser, with only basic features. You get your Gore-tex, thermal lining, adjustable ankles, hip and knee/shin armour and a Cordura construction, but apart from that, all you get are two pockets. Compatible with all of Rukka's jackets, this zips really nicely into the Matti jacket and, unlike the jacket, which is too warm for summer, I can get away with wearing these with my Alpinestars leather jacket for short trips all year round. Its worth noting that I had to go up a size as the thighs were really narrow when on the bike, but still a fine piece of kit, comfy on and off the bike (when you get the right size of course) and well worth the money. This is the second Wave protector that I've had. The first one I crashed in twice which included sliding down the track on my back at over 100mph. The actually armour part is very good as is made up of several different hard plastic peices that interlock to match the shape of the riders back. The fit is very good and is easy to adjust and it doesn't get too hot during the height of summer. I'm so used to riding with it on, that I only ever notice it when its not there. An essential peice of armour and I wont ride without one. waterproof. 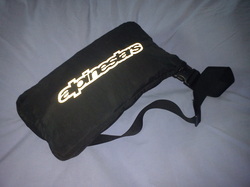 Another plus side is that it folds down small enough to wear a as bumbag allowing you to take it anywhere and it's totally unobtrusive on the bike. Other benefits to the suit include heat resistant panels on the inside of each leg, which stops it melting on hot areas of the bike. Elastic cuffs, to get the arms over the gloves and reflective logos. I'm 6ft 3 and went for the XXL size, which is a good fit over my Arlen Ness one piece suit. There are some issues however. As both my leathers have speed humps, the Velcro neck flap is far too tight when sitting on the bike and when not done up it sticks to the material on the underside of my helmet. 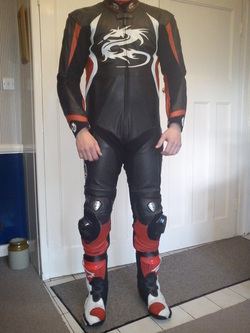 The net lining on the inside of the suit, catches on my knee sliders and its also not very easy to get on quickly, so if you need to get it in when caught in a shower and cant find suitable cover, you're going to get wet. You may also find, like I did, that its so much easier to get on when not wearing boots, but that could be size of my feet.